The outer parts of both leaves are blank: the upper leaf has two brass plates to keep together the two parts of the leaf that are badly cracked. The inner part of the upper leaf has a pin gnomon dial for Italian hours, marked in red from 14 to 24 and a string gnomon dial with common hours marked from VI to XII to VI. The inner part of the lower leaf has a compass (glass cracked) whose card is finely painted in green, red and gold. The string gnomon dial (string missing) has common hours marked from IIII to XII to VIII and is decorated with stars and leaves in the spandrel spaces. The lower part of the leaf has a pin gnomon dial with Italian hours marked from 9 to 23 and at the bottom a similar decoration of stars and leaves. 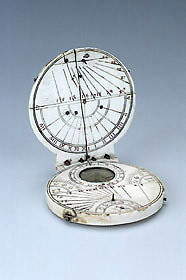 See P. Gouk, The Ivory Sundials of Nuremberg 1500-1700 (Cambridge, 1988).